What would you do with an extra $1,000, $5,000, or even $10,000 per month? And what if you could bring in that type of income every single month. Using the knowledge and skills you already have? It might seem far fetched, but it’s not. In fact, thousands of people are doing that right now. Not by working traditional jobs or even freelancing. But through blogs, websites, and small, online businesses. Will everyone who attempts any one of these methods earn $10,000 per month online? Not likely. Can you bring in an extra $500 to $1,000 per month with the right guidance, dedication, and a little work? Absolutely. Stick with it for a few years, improve and grow, and you can turn that $1,000 into $10,000. Per month! I know there are plenty of ways to make money online. In fact, here’s a list of 67 work from home jobs, most of which are online jobs. But at some point, you want to get picky. You don’t want to spend hours upon hours every week taking surveys or doing customer service. In this post I’m going to focus on things that just about anyone can start. That can scale easily. And that are the most likely to create a residual, or passive, monthly income over time. So, with that in mind, here’s my list of ten proven ways to turn what you already know into a 5-figure monthly income stream, with real-life examples included. BONUS: Grab this free resource, 31 Successful Side Hustles, Income Streams, and Online Businesses. It’s full of ideas you can use to start earning more on the side, with the knowledge and skills you already have. I bet you know things. Things that other people don’t know. Music, programming, sales, or yoga. These are skills that people are constantly searching to learn online. You don’t have to have an advanced degree or decades of experience. But you do have to have some knowledge and the ability to share it in such a way that other can learn from you. Shayna Oliveira teaches English through her website Espresso English. Her courses cost only about $30 each. That may not seem like much, but if you have enough customers, it can really pay off. Shayna recently shared in an interview that Espresso English is at the point where she will earn $10,000 per month, almost every single month. Just using the knowledge she already has. Not bad for helping others learn a new language! Are you great at woodworking? Repairing cars? Or remodeling bathrooms? Or maybe you’re a master with health and beauty products or makeup. You can now earn a monthly income stream by using your skills to show others how to do exactly what you do to get the same results. If you’re wildly popular, you can generate revenue from YouTube views via ads. Otherwise, you’re probably better off creating your own niche website or membership area. Avalon Yarnes is a master cake decorator and artist. She runs Avalon Cakes School, a membership site with over a thousand monthly members who pay $14.95 or $24.95 per month to get access to her long, in-depth tutorials. And at $14.95, you’d need less than 700 subscribers to earn $10,000 per month. Do you like making crafts, art, or handmade goods? Ever post them on Facebook and have your friends go crazy wanting to know where you bought them? If so, you might find Etsy a great place to put your skills to work for you, and earn some extra cash each month. Etsy is an online marketplace full of products made by people from all over the world. If you make beautiful crafts, create art, make custom jewelry, purses, or … well, anything at all, then set up an Etsy store on the marketplace and get to selling. Check out these case studies of how three people started Etsy stores that are making good money! One of them, Brandi Arnold, is on her way to six figures per year selling handmade, natural and vegan bath and beauty products. Jessica and Cliff Larrew make over $100,000 per year with Amazon FBA. You ship Amazon your products and set your price. Then they post it online, sell it for you, and ship it to your customer. You get paid, minus the 30% they take for all that heavy lifting. The products can be items you buy in bulk, at a discount, or even products you source from overseas manufacturers. You don’t even have to touch a product to sell it. It sounds fairly simple – and the concept is – but there is a learning curve and it’s important that you work with products that you already have a good bit of knowledge and experience with. Here’s a list of pro-seller tips, as well as the link to the Amazon FBA page. Have you read this far, only to find yourself thinking ‘I don’t think I have anything work teaching, making, or writing about’? If so, you should consider affiliate marketing. Affiliate marketing is where you refer people to existing products or services, and in turn those companies pay you a small commission. For example, Pat Flynn is known for being a top affiliate for Blue Host. Based on his publicly available monthly income reports for his blog, he makes a whopping $30,000-$40,000 per month by sending people from his site to Blue Host. Sure, that’s not a typical result. But with companies like WP Engine (affiliate link) paying out $200 per referral, it’s not hard to imagine how one could make five figures pretty quickly. Are you a fan of niche, quirky, geeky, or weird t-shirts? Do you have an eye for design or like to keep up with current fashion trends? Use your skills make monthly income by designing t-shirts, mugs and other merchandise. I’m not talking about screen printing, ordering in bulk, and dealing with inventory. Using sites like Teespring or Cafe Press, you can simply upload your designs and manage the online store. They’ll do all the printing, shipping, and returns. Benny Hsu made $100,000 in 5 months selling t-shirts on Teespring. And you don’t even have to be a great at design. Shirts with catchy quotes, phrases, and sayings can turn into big sellers. Is there a subject that you’re exceptionally knowledgeable about? Or even a subject that you’re really interested in diving into a little deeper? Are you a good listener? Have a talent for carrying conversations? You may want to consider podcasting! There are an endless areas of interest for podcasters and podcast listeners. The more distinct your topic is, the more opportunity you have to make an impact. You’ll need some equipment, but not much. More importantly, you’ll need persistence. It takes a while to build a massive audience. And that’s where the money is. Advertisers pay you to run ad spots on your show, or you can make money with listener contributions via Patreon. Here are a few other ways to make money with a podcast. 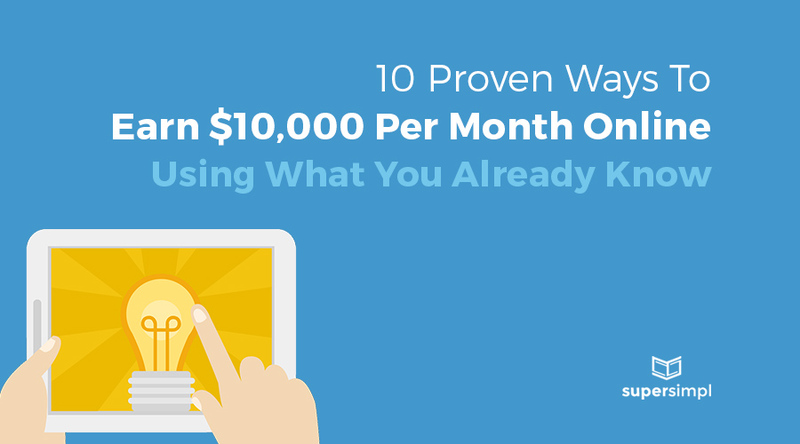 In all honesty, it is possible to earn $10,000 per month podcasting, but it’s not likely. Especially if you don’t have a product, service, or digital good to sell to your audience. Lisa Cartwright is a writer turned author, who has self-published numerous short books through Amazon. She now makes over $3,000 per month with residual income from her books. Whether you have something to say, a story to tell, or a subject to teach, you may want to consider writing books. Before you object, just keep in mind that they don’t have to be a certain length or style, and you don’t have to be the #1 expert in the world. Writing a book is not easy, but this is an especially good avenue to take if you’re not interested in audio, video, or physical products. Steve Scott, who reportedly earns over $40,000/month via publishing, walks you through the process of quickly publishing and selling multiple books on Amazon on his website. Yes, you read that right. You can make money with an email newsletter. But not just any newsletter. And definitely not your typical corporate hey-look-how-awesome-we-are newsletter. It’s got to be valuable. Very valuable. And there are several ways to create that value. You can curate news and articles on a specific topic. Send out tips on investing or managing money. Or you can even read books and email your subscribers interesting facts along with a synopsis. Where does the money come in? Well, if you get enough subscribers, you can get a sponsor or advertiser. If your content is truly valuable, you can sell a monthly or annual subscription to your newsletter. Farnam Street does the former with 400,000+ subscribers, while James Altucher does the latter for $49/year. There are companies that will pay you to review their toys. How cool is that? Not into toys? No worries, it doesn’t have to just be toys. You can review just about anything. How about starting your own YouTube channel providing reviews that aren’t sponsored by any particular company? That gives you free reign to review, compare and contrast, interview your children to see what they think. Check for safety and practicality. Not to mention the cool stuff you’ll get to see and play with, all in the name of business. This father and son team are making a cool $1 million per year with their YouTube channel reviewing toys. Would you like to start turning your own knowledge and skills into a regular monthly income? If so, grab this free resource, the 10-step plan for building a $1,000/month (or more) side business or blog. I have read all the above and I know people do make their income based on the above info and I would love to learn more as well so I can do the same. I would really appreciate to learn how get started! Thank You! how do I get more information on making money for free? Thank you so much for posting this article. It was an enjoyable read. Thanks for the amazing ideas. Now I feel encouraged to consider at least one of these ways. I want to make at least $35,000 in the next three years for a very very important cause (with no money on hands to invest). I hope I will do it by then. Great foundation of ideas to begin earning income! Thank you! Thanks for this!! But what if you have a product but you are not reaching enough people how do you fix that? Hi Kelsey, without knowing exactly what your product is, I can’t give specific help. But in general, if you already have some customers, I recommend asking them if they know other people who might like the product. Try to get referrals.